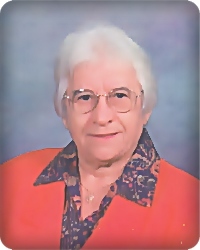 Nancy Chapel (Nadia Chaplya), age 93, of Grand Rapids, a wanderer for the Lord, went home to be with her Lord and Savior on Friday, September 14, 2018. She was born on December 31, 1924 in the Ukraine. She was taken prisoner by the German Army during WWII and brought to Germany as slave labor. Nancy was forced to work on a Christian farm. She became a missionary to Nigeria and later worked for Blodgett Hospital. She is survived by many close friends. A memorial service will be held at 11 am on Monday, September 24, at Princeton Christian Reformed Church, 5330 Kalamazoo Ave. SE, with Rev. Tim Holwerda officiating. Interment will be in Blain Cemetery with Rev. Steve Hull officiating. Memorial contributions may be made to Christian Reformed World Missions. Nancy was grateful to all who befriended her in this earthly life, like it says in Proverbs 17:17 and 18:24.